T.S. Hutton was born in Edinburgh and lived in Wavertree, before moving to Newcastle. 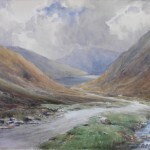 He exhibited at major galleries throughout the British Isles and painted landscape scenes including Northumberland, the North East coast, Yorkshire and Scotland. Information regarding his artistic training are not known but by the time he reached 27 years of age he was exhibiting his work at the Glasgow Institute of Fine Arts. While living in Newcastle he began exhibiting at the Berwick Club and later both the Royal Academy and the Scottish Academy. Many of his works are painted on small boards which are said to have come from shirt boxes.